An unusually large number of Illinois public high school students — at least 1 out of 10 juniors — received extra time or other help to boost their scores on the ACT, including high achievers at some of the state's elite schools. At powerhouse New Trier Township High School on the North Shore, the highest number in the state, 170 juniors — or 1 in 6 test takers — got special testing accommodations last year. Almost 1 in 5 students who took the crucial college entrance exam at affluent Highland Park, Deerfield and Lake Forest high schools got assistance during state testing last spring, according to data not previously released to the public. Dozens of those students scored in the 30s out of an ACT maximum of 36, raising questions about the edge some students are getting in the stiff competition to get into top colleges. The accommodations, including extra hours and even multiple days to finish the exam, are designed to even the playing field for students who struggle with tests because of disabilities. The vast majority of juniors tested with accommodations got below-average or abysmal scores last year, the data show. Attorney Charles Fox, who specializes in special education law and advocacy in the Chicago area, said scoring in the 30s is possible but unlikely for those eligible for testing assistance. "I have never had a student in my caseload who has not struggled even with accommodations," said Fox, who has a disabled son. Controversy has swirled for years about which students deserve special help. A 2000 California audit concluded that those getting college entrance testing accommodations "were disproportionately white, or were more likely to come from an affluent family or to attend a private school." More than a decade later, the Tribune's review of data obtained under open records laws indicates that's true in Illinois, where the percentage of test takers with accommodations doubled the national average. Schools in wealthy enclaves with predominantly white students were at the top of the list when it comes to students getting ACT testing accommodations in Illinois, the 2011 data show. Bev Johns, a longtime special education advocate in Illinois, said she wasn't surprised. "Parents in affluent areas know their rights and know how to obtain services," she said. "There are a lot of protections built in so that children should not be being incorrectly diagnosed," Johns added. The scores of students who receive accommodations are not flagged when they're sent to college admissions offices, so the schools don't know whether someone got extra help, according to the ACT company. Students can apply for special assistance if they have reading or anxiety disorders, attention deficit problems, physical disabilities and a host of other impairments. Accommodations range from large-type testing booklets to cassettes, DVDs or testing scripts that administrators read to students to the most frequently requested accommodation: more time. Students can get anything from 50 percent extra time to multiple days to complete the exam. It usually takes about three hours to finish the main English, math, reading and science sections, excluding breaks and instructions. The current junior class took the ACT last week, but students with special accommodations can test until May 8. "Double time on the ACT is like a dream," said Jed Appelrouth, whose Atlanta-based tutoring firm assists students in the Georgia, New York and Washington areas. "In my experience, every time (students) get extra time, they do better." 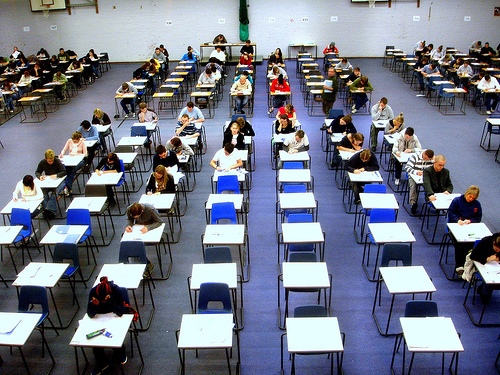 New Trier, Oak Park and River Forest High School in west Cook County and Lake County's Stevenson High School had the most students who tested with accommodations and posted scores in the 30s. One Chicago Public Schools student who received special testing assistance got a rare perfect score of 36. The student's school was not identified. At many Chicago public schools, no students got accommodations. At four schools with high poverty levels, 21 to 25 percent of the students got special assistance, but none scored at the national ACT average of 21, and many posted well below that. Twelve schools, 11 in the Chicago suburbs, had 100 or more juniors getting accommodations for the 2011 ACT. Overall, more than 15,000 11th-graders in public schools — more than 10 percent of almost 146,000 tested — got special accommodations. Nationally, 5 percent of the exams were taken with accommodations in 2010-11, according to ACT, compared with 3.5 percent in 2007-08, officials said. ACT spokesman Ed Colby said the large and diverse testing pool in Illinois, as well as in other states where students are tested as part of state exams, has sparked a rise in the number of requests for special accommodations, as well as in the number of approvals.